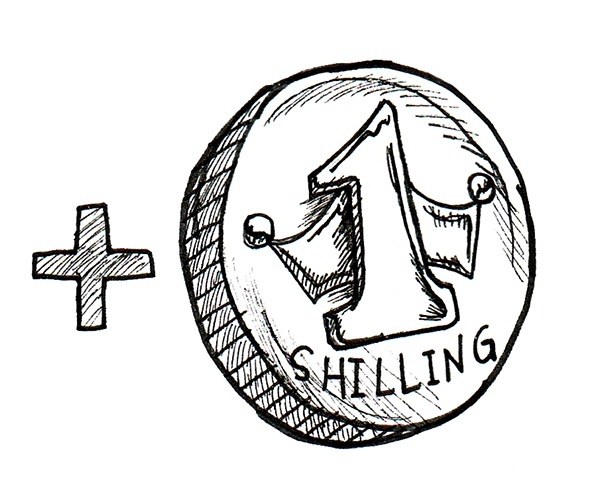 One Shilling. Card Artwork. Item type: A reward for a hard day's work of monster slaying. One Shilling is the start of more money for the intrepid adventurer. Once a job or raid is done, the adventurer may obtain a shilling for his or trouble in vanquishing yon dungeon rat or dreaded owl bear. It is the first of many shillings the brave adventurer will amass during their campaign, provided that they live long enough to enjoy it. The one item of value that is actually currency, One Shilling is a play on the money adventurers get, usually a lot, and sometimes just one gold or experience like high levels slaying low level monsters. It can also be a play on monsters, who have no pockets, unexpectedly dropping loot, or just an empty dungeon cell with one coin remaining of what was once a vast treasure trove.